Hughes shared her journey from being a decidedly average high school and college student to becoming a highly successful multi-media professional. Her experience includes working as a news and sports reporter, producing historical documentaries and, currently, creating mini-documentaries known as actTWO Stories. She intentionally chose to share her somewhat circuitous path to her chosen career in the hopes that the audience might better identify with her. “You don’t have to know spot on where you’re going to go when you leave Meredith – and you always have the power to change direction,” said Hughes. After graduating from Meredith, she got married and taught elementary school for seven years. Then she read a book that led her to re-examine her life. After reflecting on a series of questions such as what she enjoyed most as a child and what she did (and did not) enjoy doing, she realized that she wanted to become a visual storyteller. Hughes had always loved sports and thought she would like to work in the field. Her next step was to gain experience, no matter how small the job and how unprepared she felt to take it on. She interned for WTVD. She went to Kay Yow at NC State and offered to volunteer; Yow told her she could run the 30 second clock. She was the color commentator for the NC State radio broadcast of women’s basketball games for two years. And she appeared in some commercials, including one for Jeff Mullins, a former NBA basketball player who owned a Chevrolet dealership in Charlotte. That led to her first big break when she called Mullins and said she wanted to work in sports. She landed a job with the ACC Sports Center pregame show. Since then, Hughes has worked as a “visual storyteller” in a variety of settings. She was one of the first female sports reporters in the Southeast. She was the first civilian and the first female media liaison with the Richmond, Virginia, police department. She’s been a news reporter, TV anchor, documentarian, producer, photographer, and editor. Eventually she decided she wanted to produce longer form stories and moved to Wilmington, N.C., to produce documentaries, a number of which have been distributed nationally. Two went on to win four Regional Emmy awards, with three more nominated. Through her most recent project, actTWO stories on YouTube, she is telling stories of people who get to the second part of their lives and ask the question, “Now what?” She shared one of the actTWO stories she had produced, which showed a man who had worked as a dentist for 48 years but had always wanted to be an artist. He is now pursuing his dream of sculpting. 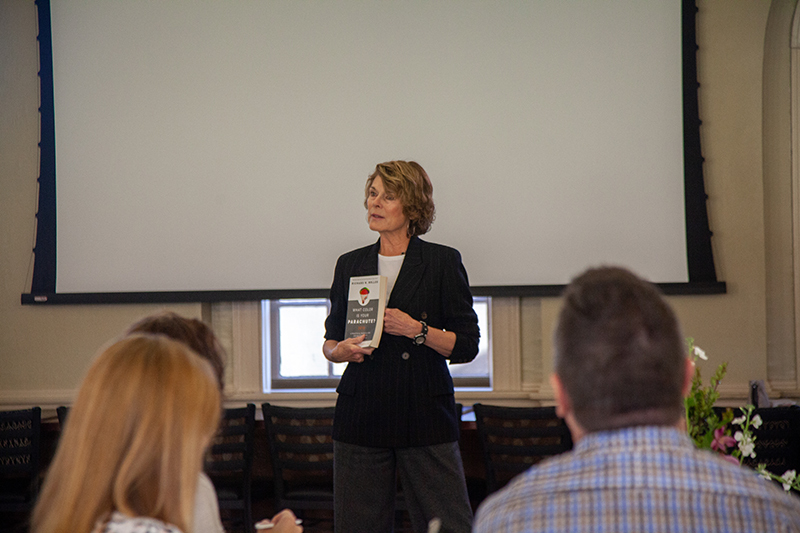 At the end of her talk, she gave two attendees copies of the book that prompted her to pursue her passion: What Color is Your Parachute, a classic job-search manual that has been in print since 1970. In addition to her talk, while on campus Hughes spent time with communication students and conducted a workshop on video storytelling. 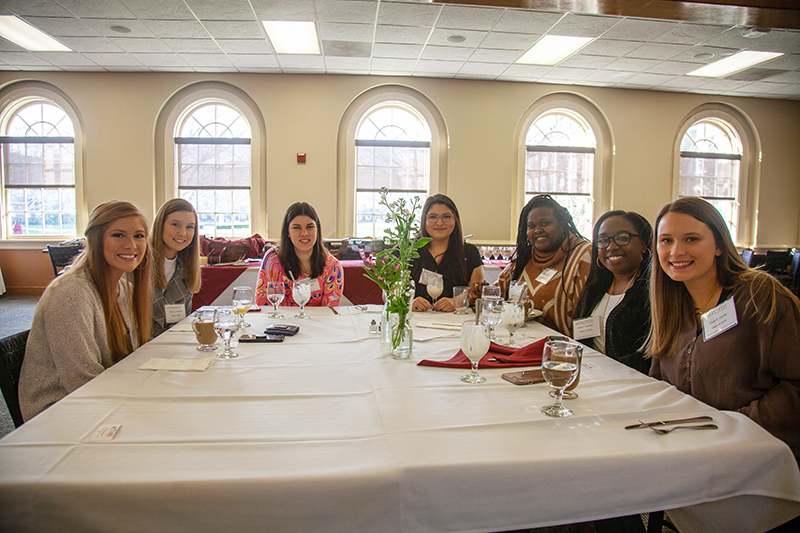 The audience included students majoring in communication, alumnae from the Class of 1970, and faculty and staff, who said they found Hughes both reassuring and inspiring. Lindsay Sutton Beavers, ’03, who majored in communication at Meredith, said that although she’s enjoying her marketing career, she has a dream of opening her own agency. In turn, Hughes said she was “incredibly impressed” by the students she encountered at Meredith. Brenda Hughes’ presentation was part of Communication Week, an annual series of events sponsored by Meredith’s Communication Department.